Fort Craig was built in 1853 by the 3rd U.S infantry regiment as part of a new series of forts along the American - Mexican border. It was completed the next year in 1854 and was garrisoned by troops from Fort Conrad, based five miles away.It was named in honor of a popular officer from the Mexican - American war named Captain Louis S. Craig. The fort was put in place along the border area to deal with the rising number of Apache and Navajo Indian raids on traders and settlers. They had been frequently attacking trading caravans and harassing settlers moving through the area, often stealing from and killing them. The forts construction was of poor quality, with soldiers frequently complaining about leaky roofs, crumbling walls and chimneys, the overcrowded living conditions and lack of proper flooring. All of this combined with it being miles away from the nearest saloon or anything that wasn't another soldier made life here quite miserable. By the middle of 1861 the fort had became the largest fort in the south-west and held over 2000 soldiers. The reason it was well populated saved it from ever being directly attacked, with confederate armies choosing to march well round the fort instead of risking attacking such a heavily fortified position. The fort did do its part during the war though with it being an important base to send out troops to do battle with the confederate armies, with several smaller battles being fought in the area. 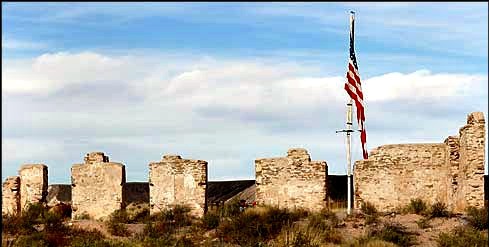 After the civil war the fort was again used as a headquarters to deal with threats from various Apache tribes, but was permanently abandoned in 1885 as the threat receded. Today there is little left of the fort, since it hasn't been occupied since 1885, and the original poor construction combined with years of weathering and being blasted by sand has only left a few small sections of wall and small mounds where buildings once stood. The stories of paranormal activity at Fort Craig are kind of boring to be honest. There is very little left to see here and its very hard to tell which buildings would have been where when the fort stood whole, so you don't really know what the piece's of wall that are left even were. Reports of activity here mostly consist of EVP captured close to the walls and also people claiming to hear whispers in the area. Apart from this there are the usual orbs and strange things appearing on camera such as unexplainable mists and such, and also the claim from a number of people who said they have seen the apparitions of past soldiers in the area.